Quite often you'll hear Sa Bom Nim explain to students and visitors that the rules of the school are written clearly on the wall. The second rule, Yei, means respect and etiquette. It's actually the very first lesson taught when joining the school; it was when the instructor first asked you to bow before stepping on the training floor. Bowing in any martial art is a sign of respect and should be a sincere slow bow. It is sometimes more disrespectful to bow incorrectly than not to bow at all as this is a sign that you do not understand the reason behind the gesture. Beyond the outward gesture of mutual respect, the simple act of mindfully bowing will help you develop a kind of personal "radar". When you actively look for people in your presence to greet, you automatically develop an awareness of friends (or foes). The mindful practice of this simple act can develop an extraordinary ability. Awareness of one's surroundings is key to self-defense. 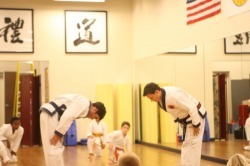 Some martial arts may differ but in Tang Soo Do you must always be in attention position when you bow. So make sure you have no gaps between your feet and your hands are placed smartly at the sides of your body. From your waist bend 45 degrees and lower your eyes to the floor. Hold the position for a split second before coming back to your original standing position. Bow from attention position with your feet touching. Looking at your instructor or training partner shows mistrust, so ensure you always lower your eyes. Bow 45 degrees from your waist slowly. Never bow while you are moving. Always stop and stand in attention position. It is important that you also know and understand the correct time to bow. Sometimes you see students bowing all the time without understanding what they are doing. Bowing constantly makes bowing meaningless. It is often just seen as something you have to do and go through the motions of before and after a lesson. When you bow to someone you are making a public gesture that you respect them as a person in the martial arts and what they stand for. That is why every time you bow it should mean something both to you and the other person. Half hearted bows or a simple nod of the head don’t symbolically mean anything; it is a lack of etiquette if anything. Bowing, especially for adults, is also a very humbling experience. To acknowledge that someone else, irrespective of age, has more experience and knowledge than you can sometimes be quite difficult to grasp. Also bowing when you enter and leave the Dojang is not for anyone else but you. This simple action reminds you that you are there to listen to the advice of the instructor and approach learning with an empty cup. Would you bow as you entered or left the Dojang if you were the only one there? Always remember that a bow is a physical gesture of your inner self. If you do not respect someone for a valid reason do not bow. A false bow or incorrect bow is worse than no bow at all and it is important that every time you bow it is genuine and means something to you. Bear in mind that you do not have to like a person to respect them in the martial arts. To like someone is only an added bonus. When greeting your instructor, whether inside the Dojang or not. When wanting advice or help from your instructor or a higher grade. When entering and leaving the Dojang. When your instructor has given you advice whether individually or as a class. Before and after working with a training partner.